The Wall Street Journal (WSJ) asked that very question during recent interviews with Doug Woods, co-founder and the D in DPR, and Matt Murphy, who is part of the Texas Business Unit Leadership team. How does DPR do it? What are the benefits? What are the challenges? The benefits were easy to articulate: increased collaboration, enhanced decision-making at all levels, greater opportunities for leadership, and a highly engaged workforce. Employees are empowered and trusted to make decisions. The focus is on roles, responsibilities and experience—versus titles, bureaucracy and power. That’s what it feels like to work at DPR. The Wall Street Journal interviewed DPR's Doug Woods and Matt Murphy about shared leadership for the December 14, 2016 print and online editions. The challenges, however, while slightly more difficult to accurately convey, are what builds the character of DPR from deep within. In the WSJ article, Woods mentions that the Management Committee arrives at decisions together, sometimes after “a lot of argument,” but claims the company is better off with consensus. To some, arguing or conflict is seen as a negative. In the culture of DPR, it’s a positive. We have groups of leaders, who are passionate, engaged, and openly and respectfully express/debate various points of view to arrive at the best direction for the company. It is by thoughtful design and this commitment to brutal honesty and transparency that helps build trust with all who have the opportunity to work here. Shared leadership focuses on combining the strengths of people to produce high-performing teams ready to build great things. DPR's Management Committee includes (top row) Mike Ford, Greg Haldeman, George Pfeffer, Eric Lamb, (bottom row) Mike Humphrey, Michele Leiva, Peter Salvati and Jody Quinton. For Murphy, who previously worked for more traditionally structured construction companies before joining DPR in 2013, it’s a “breath of fresh air” that has helped the Texas region thrive and grow into a tri-city, $1 billion operation. That’s the level of trust you need if you want to operate without a CEO. DPR’s collaborative spirit is exemplified through shared leadership. It began with DPR’s three co-founders, Doug Woods, Peter Nosler and Ron Davidowski in 1990, and continues with DPR’s Management Committee and throughout the company. One of DPR’s four core values is Ever Forward: “We believe in continual self-initiated change, improvement, learning and the advancement of standards for their own sake.” This core value, combined with our other core values of integrity, enjoyment and uniqueness, has served us well. It has helped sustain our desire to be a progressive and nimble learning organization, where people are empowered to drive continuous improvement for our customers and their projects. DPR has always been a thinking organization, with people willing to learn, change, adapt, move and build it better. But as we move forward and further dissect the intent of our Ever Forward core value, we must also be mindful of where standards (or the advancement of standards) fit into our entrepreneurial company culture and our customer-centric industry. Well-crafted standards and proven current best practices (how we like to think of them at DPR) are the basis for improvement and can help set a strong foundation for consistency and reliability. Read the full story about how we’re working together to set new standards and then advance them for advancement’s sake in the DPR Review. As we wrap up our 25th anniversary year, check out the latest good news from all over DPR. Here is a snapshot of company news, including project milestones, community outreach, industry events, and awards in the Across DPR section of the latest DPR Review newsletter. The successful conversion of two existing wet labs into two Class 100 and two Class 1000 cleanrooms for the University of Texas at Austin Micro Electronics Research (MER) Cleanroom build-out, which won an excellence in construction award from the Associated Builders and Contractors (Central Texas). CBS Sunday Morning explored the topic of millennials in the workforce in a segment that featured DPR as an example of a company that empowers its employees—millennials included. The Nemours Children’s Hospital new Ronald McDonald House, themed “The House That Love Built”, kicked off construction with the help of a very special guest. In November, the San Francisco Business Times honored Co-Founders Doug Woods, Peter Nosler and Ron Davidowski (the D, P and R) with a Most-Admired CEO award. In October, more than 300 attendees celebrated the ribbon cutting for the Father Martin’s Ashley Skip’s Hall for Integrated Addiction Treatment. How did the team for the UCSF Medical Center at Mission Bay in San Francisco successfully accommodate $55 million worth of changes to the project midway through construction without adversely impacting the budget and scheduled opening date? As shown in the infographic below, the almost decade-long journey to create the $1.5 billion, 878,00-sq.-ft. world-class medical center included 1,200 designers and builders—250 of which co-located together. The integrated, high-performing team delivered final results including $200 million in savings, improved quality and completion eight days ahead of schedule. With an on-time opening of Feb. 1, the 289-bed medical center includes Benioff Children’s, Bakar Cancer and Betty Irene Moore Women’s Hospitals. Learn more about the project—the collaborative approach, how the team determined the most effective approach and used BIM—in this story or this extended case study. For 25 years, DPR has been serving customers across the nation by bringing our technical expertise to a regional level through our 20 offices. These regional offices allow us to support customers wherever we are needed and respond to the frequently changing needs of the construction industry. In Texas, we broke ground on the Capital One Plano campus. The 5,900 employees on campus will be glad to hear that this four-story building will include a game room, collaboration spaces, cafeteria, and training rooms. This will be the seventh building on the Plano campus and is expected to be complete by early 2017. In the Mid-Atlantic, we continue to be part of the growing data center presence and recently broke ground on the 45-acre Equinix Ashburn North Campus. This will add 1.2 million sq. ft. of data center space to the area in Northern Virginia referred to as “Data Center Alley,” where up to 70% of the world’s internet traffic flows through. In Florida, we are renovating the Boca Raton Gloria Drummond Physical Rehabilitation Institute. This project will make it possible for patients to receive speech therapy, assisted daily living, cardiac rehabilitation, wound care, aquatic therapy, diabetes treatment and more. In San Diego, the next generation of nurse scientists, educators, and practitioners are continuing their education at the University of San Diego Beyster Institute for Nursing Research. This new building, complete with a simulation facility featuring computerized mannequins, was completed in just 16 months and is now a national model for nursing education. The list could go on, but we'll keep it brief. While this is just a glimpse of what we're up to, DPR's strong national presence allows us to continuously embark on many amazing projects such as these and provide a consistent experience for our customers every time. If you’re sitting in your office reading this, take a moment and look around. What do you enjoy most about your workplace? Is it something specific, or is it something a little less tangible? What is it exactly that makes a workplace great? According to Gallup, the average American adult works 47 hours a week, which adds up to 2,256 hours of your life per year. That is just one of the many reasons why CEOs, HR departments, and psychologists across the country have put in so much time and effort into researching what makes a workplace great. Ron Friedman, a psychologist and business consultant, recently published a book called, The Best Place to Work: The Art and Science of Creating an Extraordinary Workplace. In his book, Friedman suggests that one of the best things employers can do for their workplaces is to challenge their employees, without overwhelming them. With the right amount of challenge, employees will feel empowered to come up with their own best approach or solution to a problem. In addition to empowerment, people need to feel like they are part of one culture. When Fortune magazine spoke to China Gorman, the CEO of the Great Place to Work Institute, she said companies succeed when they create one consistent culture throughout the entire organization. By doing so, employees will be better equipped for collaboration, which ensures customers will have a consistently excellent experience. 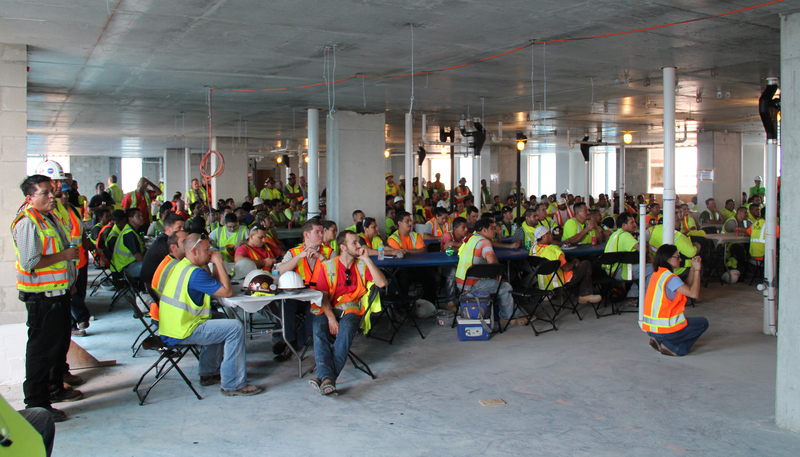 DPR strives to not only build great things, but to build great people – and it shows. For five consecutive years, DPR has been awarded a spot on Fortune’s Best Places to Work list for reasons such as our open culture and our environment of trust that empowers employees at all levels to make decisions in the best interest of our projects, our customers and our company. This feeling of empowerment can be felt throughout all of DPR’s regions. In 2015 alone, the Triangle Business Journal, the Dallas Business Journal, Florida Trend, and the San Francisco Business Times have all given DPR top spots on their lists of the best places to work. *This blog post is part of a series that celebrates DPR's silver anniversary and focuses on 25 great things from the company from over 25 years. Here's the last one. Follow #DPR25 on social media to learn more. Many of us work in constantly changing industries, and construction is no exception. In these kinds of environments, it's important to keep up with industry news to catch up on the latest best practices, and also see what's on the horizon. This news article from 2008, for example, is a glimpse into the earlier days of building information modeling (BIM) in the construction industry. This article from Forbes is from 2010. As the use of BIM has evolved, the industry recognized it as a method that skilled teams could use to lower costs while maintaining a high level of quality and accuracy, especially on projects with a higher level of complexity (such as healthcare facilities). Fast forward to 2015...DPR continues to demonstrate that teams using BIM can benefit on complex projects, such as the Banner Boswell Medical Center Hybrid Operating Room. Throughout this project, the team used BIM to eliminate the need for significant rework in the field and also minimize shutdowns to the facility, delivering predictable results. Boca Raton Regional Hospital breaks ground on its new rehab institute in Boca Raton, FL. Looking back on the years, DPR has been mentioned in more than 700 electronic news posts total, as captured in the News section of our website. This news reflects the continual improvement we strive for as a technical builder. 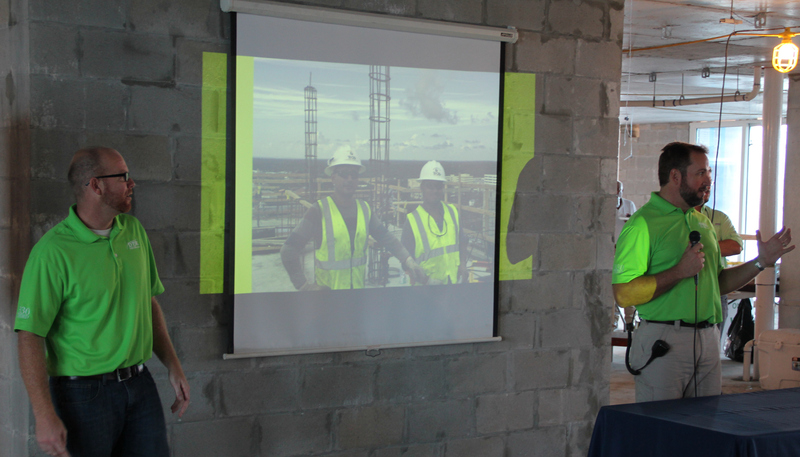 In the latest installment of CBS Sunday Morning, the report "Millennials: New kids on the block" features DPR Construction's millennial employees. The youngest generation in the workforce, millennials are those born between 1981 and 2000. The report also features Doug Woods—the "D" in DPR—a member of the baby boomer generation. Starting at the five minute mark of the video, Woods responds to the stereotype that millennial employees are overconfident. "What generation doesn't have those feelings?" he replies. "I grew up in the '60s. We were totally rebellious, and I think it's part of being young." The feature then focuses on Alice Leung, Michael Pearson, Deepti Bhadkamkar and Brian Bolandi—some of DPR's millennial employees—who discuss how they view their generation and how growing up being told "you can be anything you want" affects them in the workplace. While DPR's millennial employees may not fully embrace the label of their generation, they confess it sometimes fits. As each previous generation can attest to, today's youngest generation will eventually become tomorrow's older generation. As Brian Bolani puts it, "I'm 28 years old and I found myself saying, 'Kids these days!'" Empowering employees is the key to building a solid future. As pointed out by the Talent Culture earlier this year, DPR empowers its employees with a flat, egalitarian culture without hierarchy. The principle of “what’s right, not who’s right"—listening closely to all employees, regardless of position—resonates with all generations, but specifically connects with millennials' sense of wanting purpose or meaning behind their jobs. Their desire fits with DPR’s way of connecting work to a greater goal—for example, taking pride in building a biotech manufacturing facility that produces drugs that benefit cancer patients. 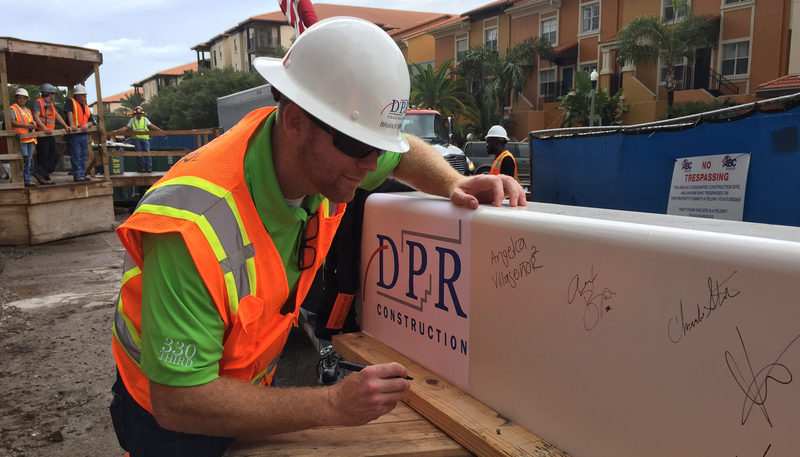 DPR aims to inspire all its employees (millennials, baby-boomers or any other generation) to take pride in building to improve the world we live in. 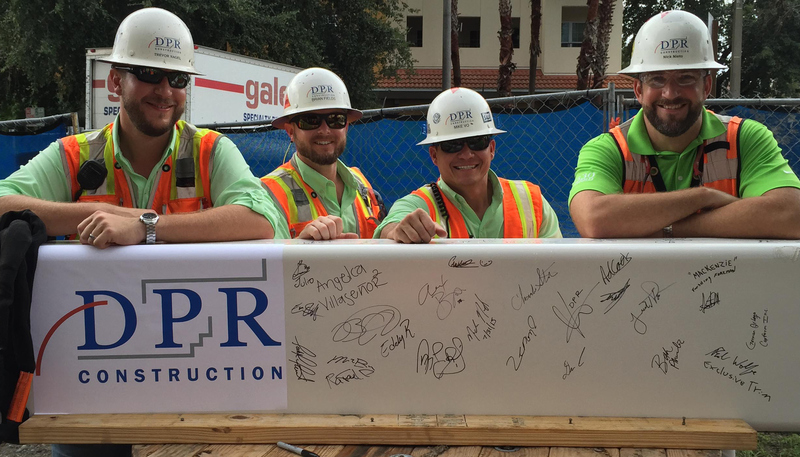 In late July, the DPR project team at 330 Third Street South Residences in St. Petersburg, Florida, celebrated with a traditional topping out ceremony. 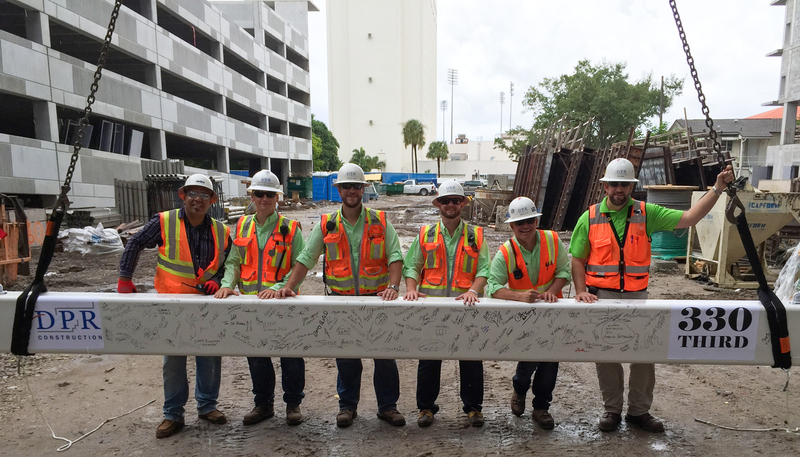 The ceremony marks the occasion where the team puts the final beam in place, signifying the end of structural steel erection. 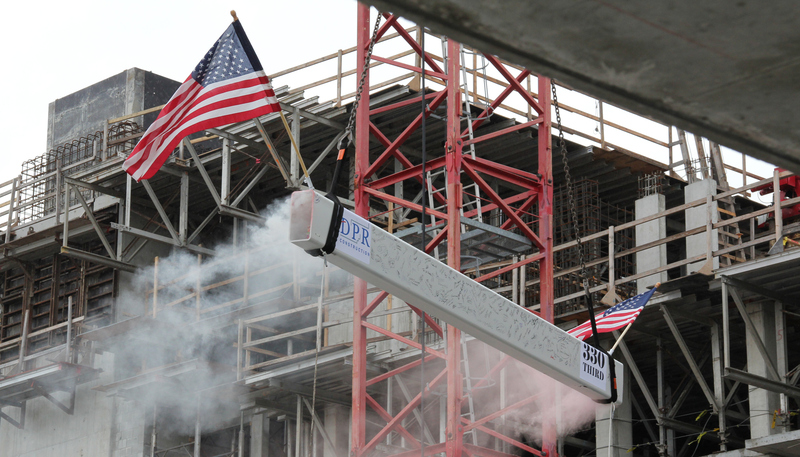 More than 400 people—subcontractors, neighbors, local business owners, community leaders, project design partners and owners—joined the DPR team for a lunch celebration, safety presentation, and the ceremonial raising of the beam. Located on an urban, three-acre site in the heart of downtown St. Petersburg, the 625,394-sq.-ft., 19-story residential tower will include 17 residential stories and a rooftop with an amenity deck. The rooftop will serve as the amenity level with a sun deck and pool. Other amenities located throughout the tower will include a fitness center, business center, clubroom with exhibition kitchen, and observation deck. A detached five-level parking structure will provide 596 vehicle and 100 bicycle spaces for both residences and patrons. Completion is scheduled for Spring 2016. The beam is ready to head to the top! Curious about the future of the architecture, engineering and construction (A/E/C) industry as well as forward-looking trends within various building sectors? Building Design+Construction (BD+C) magazine's 2015 Giants 300 Report, released earlier this month, reveals that and more. According to the comprehensive report, DPR ranked No. 11 on the list of the largest contractors, as part of its ranking of the largest A/E/C firms in the nation overall, based on revenue. Other rankings, such as data centers, will be coming soon. According to the construction report, the industry can "expect spending for nonresidential construction to rise in 2015 by somewhere in the 6.4–7.7% range." In an assessment of healthcare, the report revealed that "hospital and medical office construction [is] facing a slow but steady recovery." The report also mentions that "in Florida, where healthcare construction is up 20% from 2010, DPR Construction recently started on the 33,000-sf Gloria Drummond Physical Rehabilitation Institute for Boca Raton Regional Hospital. Working with architect HKS, the contractor is renovating existing therapy spaces, upgrading exterior features, and adding an aquatic therapy center." Delivering great projects and great value to clients has led to DPR's consistently strong ranking on the BD+C's Giants 300 report. Living proof that giant dreams can yield spectacular results, DPR was built on the dream of its three founders 25 years ago, and as of today, employees have put in some 80 million work hours total since 1990. Suspending the laws of nature, it would take a single, very tired, person around 9,000 years to do that (if they worked nonstop). Part of the 80 million hours is self-perform work, which makes up a growing proportion of DPR's total work hours. As a general contractor and builder with its own crews performing trade work, including concrete, drywall and doors, this helps us maintain control over schedule, quality, safety and cost on projects. It also gives the flexibility to explore and adopt innovative ways to work and source materials, delivering better projects and better overall value to clients.